Snacky Squirrel Game Just $10.55! Down From $22! PLUS FREE Shipping! You are here: Home / Instagram / Snacky Squirrel Game Just $10.55! Down From $22! PLUS FREE Shipping! At Amazon, you can score this Snacky Squirrel Game for just $10.55 down from $21.99 PLUS FREE shipping! Sneak in the fun of learning colors with the Sneaky, Snacky, Squirrel Game by Educational Insights. Your forest friends are hungry and they need your help! Spin the spinner, squeeze the matching colored acorn with your Squirrel Squeezer, and place it into your log. Be the first to fill your log with delicious acorns and you win! You could also spin ‘pick an acorn,’ ‘steal an acorn;’ or ‘lose an acorn,’ so be strategic, little squirrel. NO READING REQUIRED! Your forest pals are hungry and need your help. Help them find their acorns in this fun and addictive toddler board game designed to teach young children about colors. Easy to understand and play—no reading required. Easy set up and clean up; box doubles as storage. BEST-SELLING PRESCHOOL GAME 5 YEARS RUNNING! 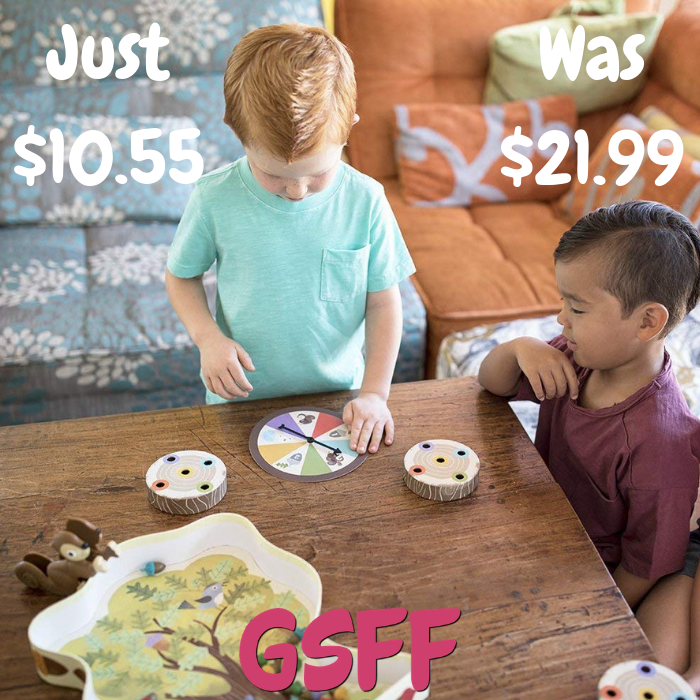 Reinforces color learning and helps develop matching skills, strategic thinking, turn-taking, hand-eye coordination, and fine motor skills. HOW TO PLAY: Spin the spinner and pick up the matching acorn with your Squirrel Squeezer, placing it in your log. The first to collect 5 acorns wins! INCLUDES colorful tree-shaped game board, Squirrel Squeezer, 20 colored acorns, 1 game spinner, 4 logs, and instruction guide. AWARD WINNING! Winner of Parents’ Choice Award, Dr. Toy Best Picks, Good Housekeeping Best Toy, Canadian Toy Testing Council, and NAPPA Games Honors awards.